Hemi cylinder heads are notorious for developing cracks between the spark plug hole and intake valve as well as numerous other locations especially if large valves are installed and the heads are ported. In addition, if the water holes on the combustion chamber surface of the head have been plugged, they are also prone to leakage. Having had experience hydraulicking an engine due to water leakage, I pressure check the heads every time the engine comes apart. If you see me at the races, you’ll notice I still crank the engine backwards just as a precaution – paranoid after 40 years! The basic kit consists of (2) plates for covering the water jacket holes in the intake surface of the head. 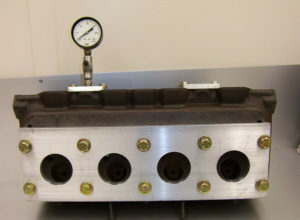 One plate includes a gauge and a valve to add air. This kit is intended for heads with all water distribution holes in the combustion chamber surface plugged as would be typical with a filled or unfilled block where water is to be used in the head only. Block-off plates for end of heads not included. Refer to the “Tech” section for a discussion on filled vs unfilled blocks in addition to plugging the holes in the heads. The second kit is for heads that do not have the holes plugged in the combustion chamber surface as with a block where water will be circulated or a block that is partially filled. This kit includes the (2) plates described above in addition to a full length 1/2″ thick aluminum plate with bonded rubber pad and attach bolts for the combustion chamber side. No need to remove o-rings.